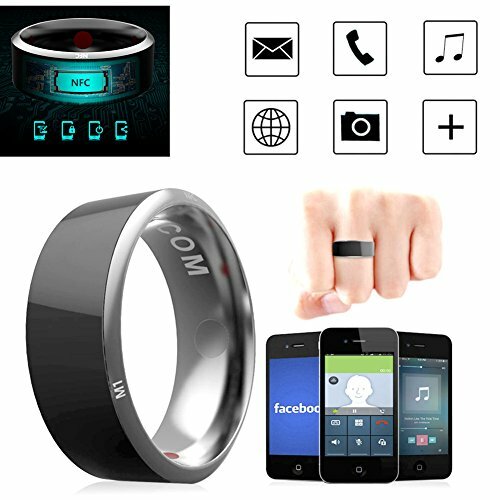 The smart ring is a Wearable electronic components, it can connect IC / ID / NFC Card Reader like doorlock or cellphone to Unlock, Pay, Share information or Operate some mobile function. Germanium is a kind of rare metal and its content is only about 0.0007% in the earth's crust. It has superbly high health care efficacy, can improve the modern people's comprehensive symptoms caused by the lack of exercise, working pressure and air pollution. FIR Energy Stone. All materials extract from natural mineral ,so that can release more pure Far infrared ray , Scarlar Energy and negative ions . Effectively improves the "Krebs Cycle" ,Thus improves Energy , Endurance and Strength .It also can help peploe effectively resist the electromagnetic wave from computer ,phone or electrical appliance. Private Note - Save all kind of private information to this Smart Ring ,For example ,Schedule,Accounts,Memo ,etc. And set the Ring Touch action to be the only way of View or Edit. Mobile phone lock - Set screen lock and APP lock randomly and let ring become the only key to your privacy. Quick start - Quick start multi-function scene mode, release the hands with high efficiency. Share information - Touch to share "Card", "Website link", and "Message & pictures", and pass on information effortlessly, efficiently and specially. 【WIDELY COMPATIBILITY】- Support phone models such as Nokia, Sony, Samsung, HTC, MIUI and all other NFC-enabled Android and Windows Phone systems. PLEASE NOTE: This item only can work for the Android and Windows Phone which support NFC function, Please confirm your device if your phone support NFC before purchasing. Thank you.